Communication is key to any successful business. From front of house to staff on the road, right down to the mail room and up to the executive quarters; good communication is pivotal for premium business performance. Until recently, it was only the major corporations who could afford feature-rich office telephone systems to keep up with the demand of their communication requirements. Now, thanks to advanced VoIP telephone systems, many more businesses can enjoy convenience-savvy business phone systems just like the big companies have been making use of for years. VoIP telephone systems offer fully customised benefits that can prove especially advantageous for smaller businesses, with a flexibility to tailor automated attendants, streamlined conference calls, and better access for employees on the road. 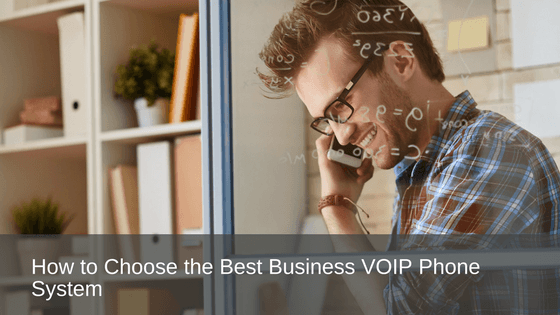 Choosing the right VoIP phone system can be overwhelming to a novice, so we’ve put together an overview to help you make an educated and informed decision. How is a VoIP telephone system set up? A VoIP telephone system uses your computer network’s cables and routers and does not require its own. The phone is connected to a workstation via an Ethernet cable from a wall jack. Calls are generally sent via the internet and your IP, so there are no separate telephone line rental charges. This is a type of office phone system housed and managed off-site by a third-party provider, quite often a traditional telephone company which has diversified into VoIP services. This company will take care of the maintenance of the system as well as playing host. Hosted VoIP systems can prove a convenient option for businesses who simply don’t have the manpower or IT know-how to do so themselves. The costs associated with setting up a hosted VoIP system are generally quite competitive these days. Be sure to take a look at the types of calls your business makes (international, local, etc) and your call patterns before selecting your hosted VoIP plan. Often you will also need to pay a fee for installation and specific telephone hardware required to run the hosted VoIP system, as well as the monthly fee for hosting. The positives with a hosted VoIP system – the initial set up fees can be relatively minimal for the long-term benefits you receive. Set-up speed is also very quick. Hosted systems are maintained and upgraded by the third party, with minimal fuss required your end. The downside to consider with a hosted VoIP system – sometimes once locked into a hosted contract it is hard to exit if the need arises or if you find a better deal elsewhere. Hosted systems are fully dependent on your internet connection, so if that crashes your phone system is also jeopardised. The difference with an on-premise VoIP telephone system is that your company purchases the hardware and software required to run the system and houses it. As the owner of the equipment, your company is also responsible for the maintenance and upkeep of the system, and this would involve dedicated in-house staff or a service contract arrangement. It is generally more expensive to set up an on-premise VoIP telephone system for the sheer fact that you need to purchase the equipment, however, in the long run, this has a potential to be a more viable option for companies larger than 10 employees. Whether deciding on an in-house VoIP system or choosing a hosted VoIP service, you might like to take these quick tips into consideration. Make sure that your service provider offers a quality of service. This is a term used to describe a protocol that gives priority to your voice packets over the data packets. Customer service and quality of sound will vary significantly between providers. VoIP telephone systems offer a packet of advantages for businesses that were once only ever dreamt of. You have some insights which will help when you are investigating the many exciting office phone system options that are accessible for top-notch business communication conveniences. If you want more detail about how a VoIP telephone system can benefit your business, check out some of our free tips offered here on our insightful blogs. Need some guidance? At Prosum, we are experts in communication and technology solutions, we provide office phone system recommendations, including hosted telephony and on-premise telephony solutions to businesses of all sizes, across all industries, right around Australia. With 50 years of expertise, no one knows technology and communication like Prosum. If you would like more information or need help in deciding on the best business communication system for your business, contact us today for expert advice – call 1800 007 229 or visit www.prosum.com.au we’d love to hear from you.